← Previous Previous post: Melbourne Rail Link: has it been properly planned? Thanks for the nostalgia – funny how the 1980s is now a generation ago. While I agree that reading a book based on a film is a nice way to re-live the movie, I’m not sure that this was a substitute for seeing the movie again (or recording it on audio/video/digit). I love reading because I love fiction. I have every episode of Fawlty Towers on DVD but I still enjoy reading a book of the transcripts (and continue to LOL even though I know what’s coming). Marketing people will still promote book tie-ins to films, even if the movie came first. Movie ticket, DVD and book sales will all rise nicely together. @Roger, thanks – Fawlty Towers reminds me that I had the LP records of the audio of that show! They added a few bits of narration from Andrew Sachs/Manuel to describe the visual gags, and some episodes simply didn’t translate, and weren’t released in that way — I think 8 out of 12 were available on LP. @Daniel – Let me guess that Basil the Rat was one that didn’t make the cut to LP? I can’t imagine that episode without (the other) Basil & Manuel’s hilarious slapstick, nor the cheap rat puppet sticking out of the biscuit tin! 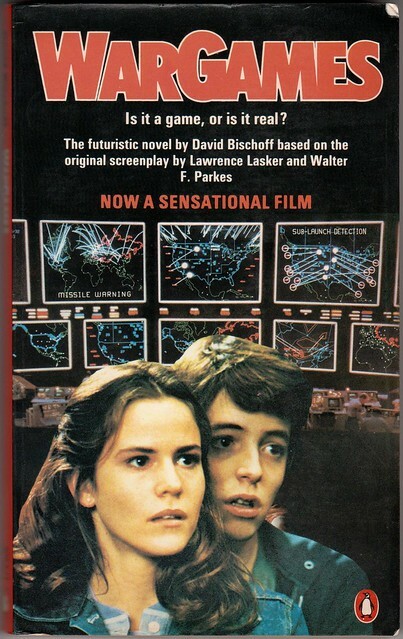 I remember seeing War Games too as a teen sometime in the early 80’s and it is a very good film. It probably was before ’84 when we got our first VCR. I can remember the first movie we rented for the VCR was “Tex”. This was the movie version of the book by the same name written by if I remember correctly S.E Hinton when she was just 17. I remember audio taping Superman:The Movie and then transcribing and typing up the whole damn thing in the mid 80s. The original novelisation of Star Wars had a bit in it that never made it into the movie: Luke and Ben Kenobi are discussing (I think) Luke’s father and Ben says something about him taking to The Force like a duck to water and Luke asks, “What’s a duck?” Implying that Ben has been to Earth?